Honoring a truth teller with the White Buffalo Calf Spirit in her soul. “Tillie Black Bear, Sicangu, walked on Saturday evening, July 19th, 2014,” stated Native News Online. Tillie humbly taught us and her message was heard around the world. The Turtle Island Project (Rev. Lynn Hubbard – Navajo Lutheran Mission, The Cedar Tree Institute (Rev. Jon Magnuson), NMU Lutheran Campus Ministry, Messiah Lutheran Church – and many others were honored to learn from Tillie. Upper Peninsula Breaking News will join those honoring her spirit. Thank you Tillie Black Bear Black Bear for teaching us about ways to treat other more kindly and with respect. Tillie taught us humility and grace – even as others sought to bring her down – because many evil doers of ill will and greed – can not handle the sun light – or the bright light that is Tillie Black Bear. One night a star will flash before our eyes – and we will know Tillie continues her work – and says hello. Documentary Reveals Heroisim of Independent Haitian Journalists. 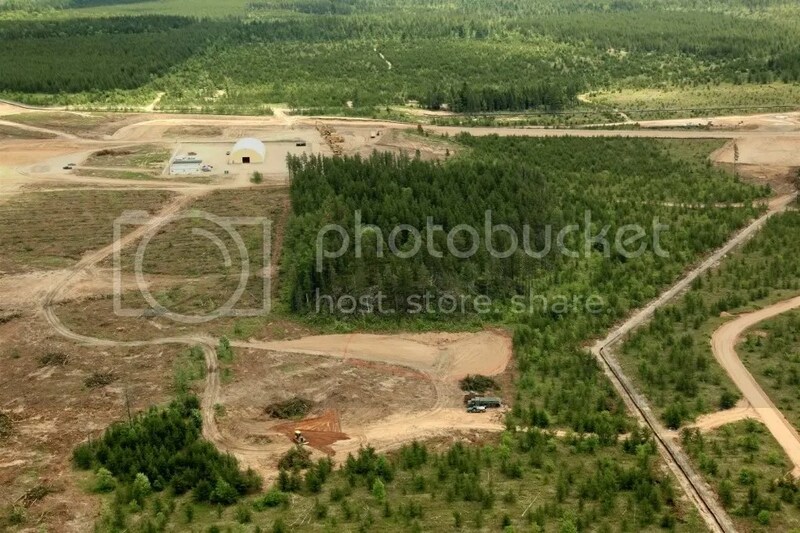 An ongoing crime spree targeting Native Americans and other indigenous peoples is outlined in a new video about corrupt Rio Tinto – a greedy and heartless international mining giant with a reputation of Environmental Terrorism and the Destruction of Sacred Sites including in Michigan’s Upper Peninsula where they plan to dynamite sacred Eagle Rock despite tears and pleas from Ojibwa to save their spiritual heritage. Please buy this video because Director Joan Sekler has dumped a large amount of her own money into the documentary because she knows how important it is to expose Rio Tinto and its subsidiaries like Kennecott Minerals. Rio Tinto has been spreading cash and other gratuities around Michigan’s political, business and judicial communities. Among those supporting the dozens of sulfide mines planned near Lake Superior are Michigan’s outgoing and incoming governors (A Democrat and a Republican) – plus as a famous Hollywood actor who claims he loves the U.P. but has refused to speak out against Rio Tinto and its acid mines. 1-4:30 pm Presentations & Discussion on Mining in the U.P. Distress Flag: An upside down flag was hung at sacred Eagle Rock in protest of EPA’s favorable ruling for Kennecott Minerals, according to standfortheland.com blog. Indian Country Today story: EPA gives OK to Kennecott permit withdrawal, warns the company to continue negotiation with opponents on ways to reduce environment damage. 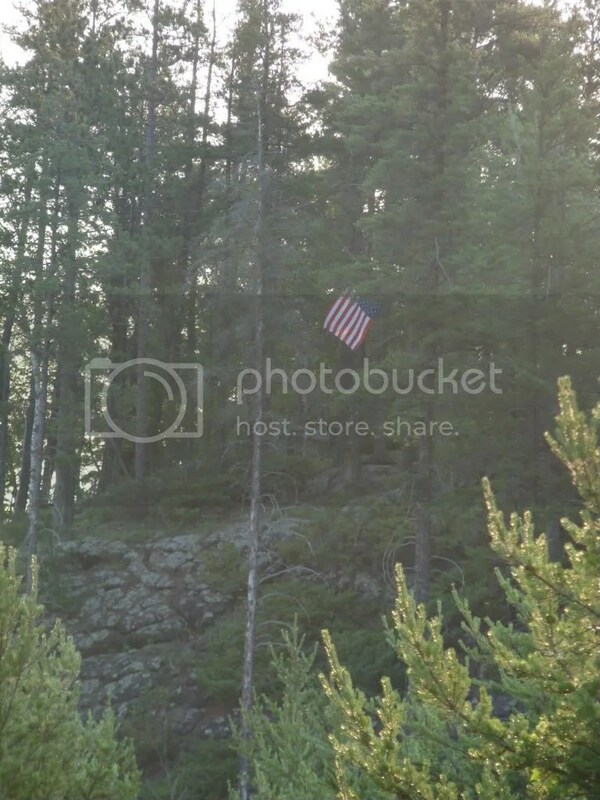 Today, we received word that an American flag was hung upside down from a jack pine on Eagle Rock in observance of the Fourth of July and in response to the Unites States Environmental Protection Agency’s recent decision to let Rio Tinto-Kennecott, a foreign corporation, decide for itself that it doesn’t need required permits to take over public land. “The flag represents three things, the people, the land, and the constitution, which is simply a statement o f the people who live on the land. Currently, I feel all three are in great distress. 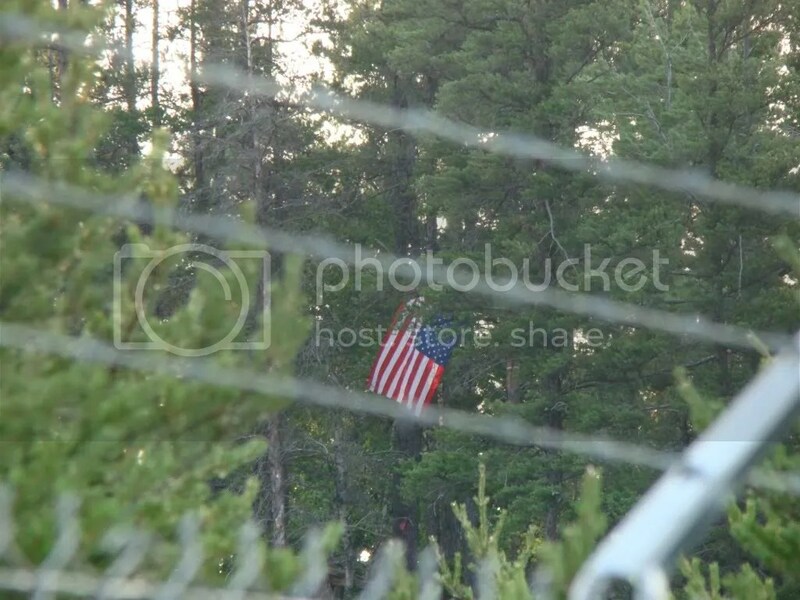 While the EPA and MI government celebrate the Fourth of July by giving away our public land to foreign corporations, remember that freedom in our country was won through the hearts and back breaking efforts of courageous people willing to take a stand. Our rights to life, liberty, and the pursuit of happiness cannot be accomplished without clean air, water and public land, which cannot coincide with sulfide mining near the Great Lakes. If you’re looking for something to do for the holiday, we encourage you to take a trip out to Eagle Rock, where the flag flies as a symbol, a simple reminder, of those brave people who have stood up for us throughout history, to protect our constitutional rights from corporate interests, big government and big money. May we all courageously follow in their foot steps. Reminder nonprofit Cedar Tree Institute annual Midsummer Festival is 5-7 p.m. on Wed., July 14 at the Presque Isle Pavillion to honor efforts to protect pollinators and Native Plants restoration. 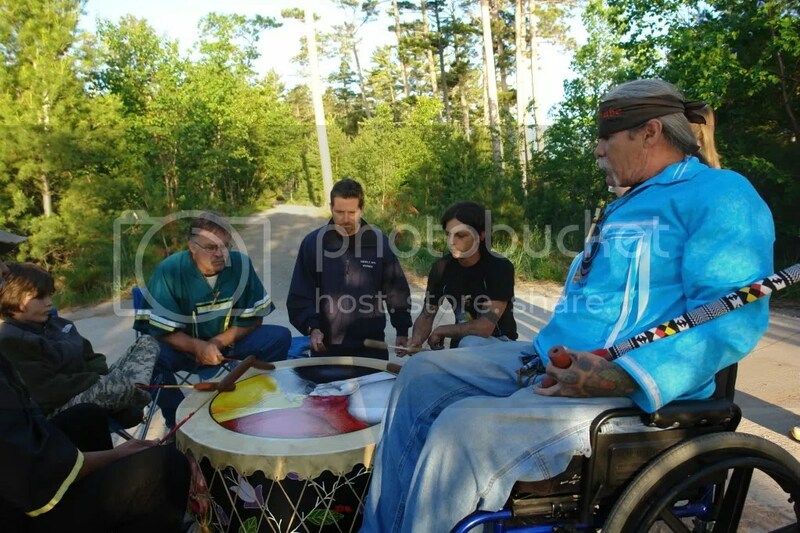 About 50 people gathered on Saturday, June 19, 2010 for a day of prayer to protect Native American sacred places. 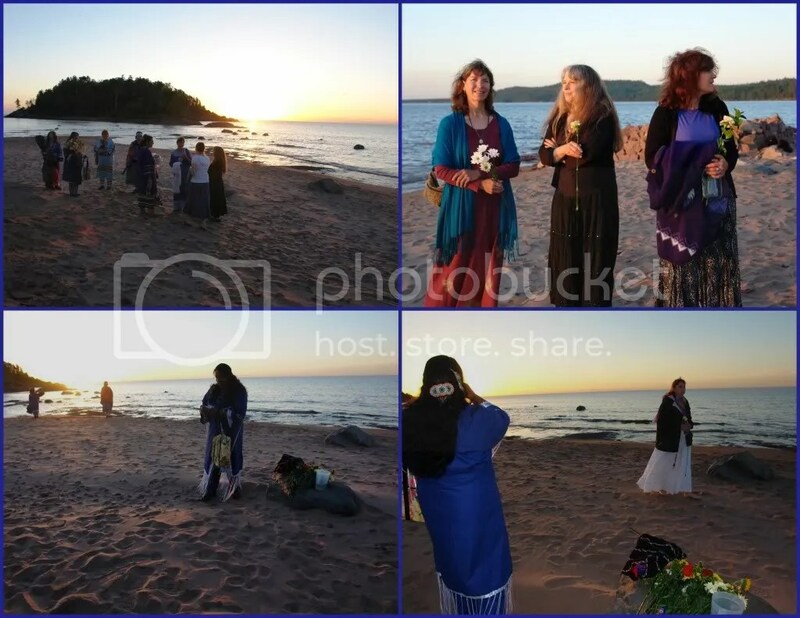 The sunrise ceremony was held at Little Presque Isle Point on the shores of Lake Superior to pray for threatened sacred places and to honor the sacredness of the water and Mother Earth. Eagle Rock, a sacred place to Anishinaabe people, is currently threatened as the proposed mine portal for the Rio Tinto/Kennecott Eagle Mine on the Yellow Dog Plains. Our fresh groundwater, waterways and Lake Superior are threatened by the Eagle Mine and increasing sulfide and uranium mining interests throughout the Great Lakes region. Charlotte Loonsfoot, left above, arrives at the ceremony. 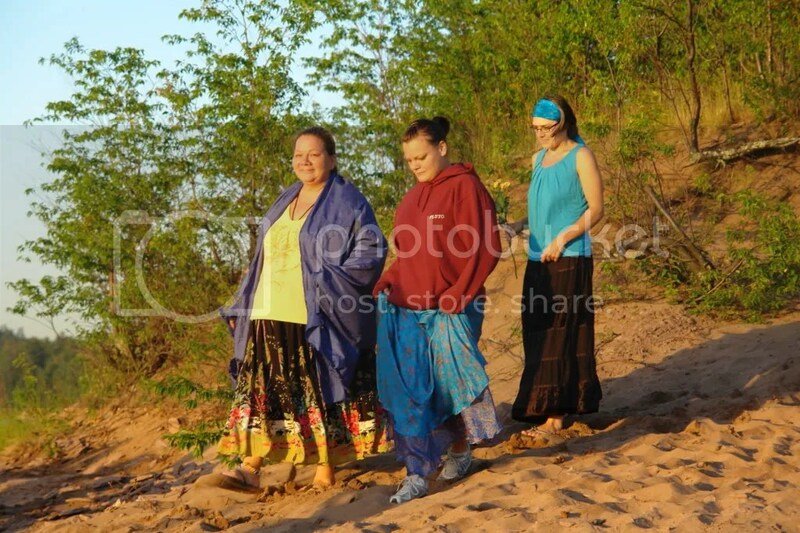 Loons foot was one of the three brave American Indian women who started the original camp at Sacred Eagle Rock on April 23, 2010. She was one of two Ojibwa arrested when police raided the camp on May 27 by orders from Kennecott eagle Minerals. The day after this sunrise ceremony, Loonsfoot, her family and a friend started another camp on the Yellow Dog Plains on public land near the mine and about a half mile from the original camp at Eagle Rock. 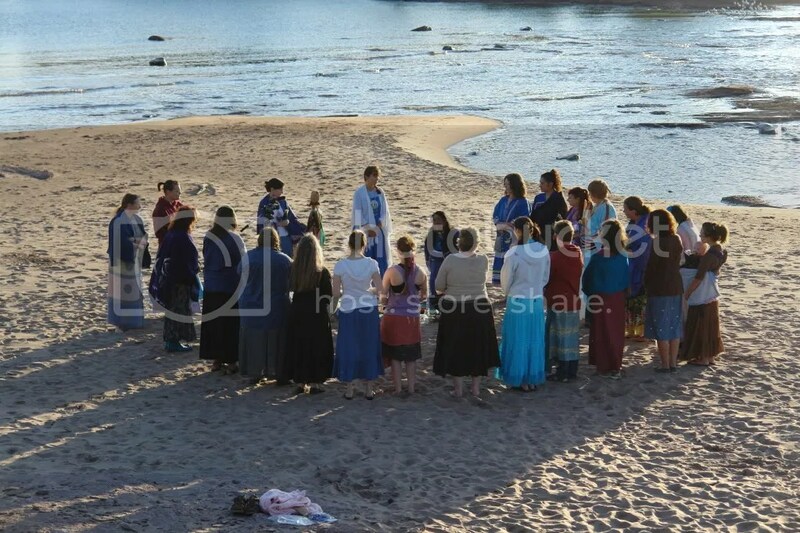 Native and non-Native people nationwide gathered for Solstice ceremonies and to honor sacred places, with a special emphasis on the need for Congress to build a door to the courts for Native nations to protect our traditional churches. 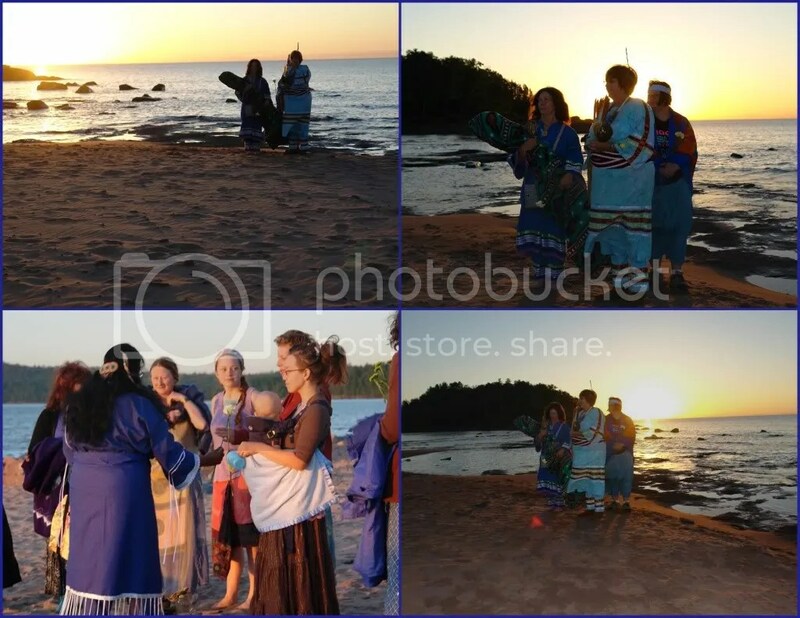 The women dressed in traditional skirts to honor Mother nature and brought blue prayer ties and blue shawls for the water. 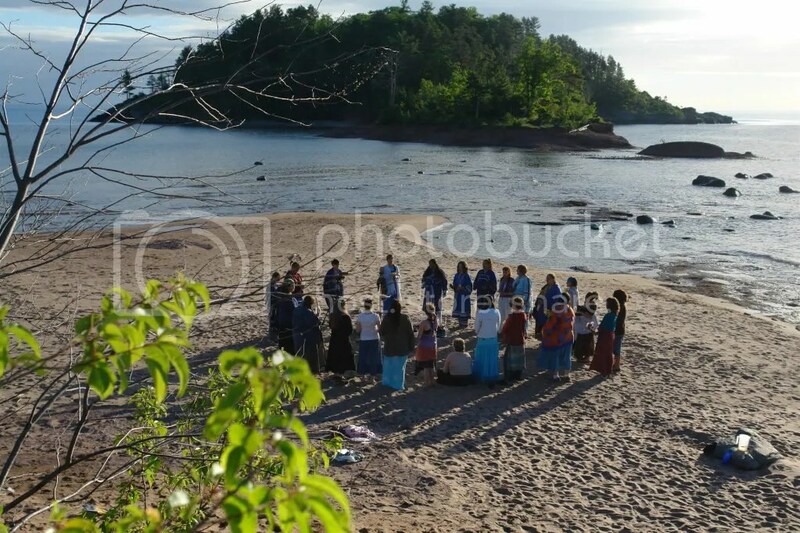 A community potluck picnic and gathering in honor of National Sacred Places Prayer Day followed at the Keweenaw Bay Indian Community Powwow Grounds Pavilion in Baraga, MI. 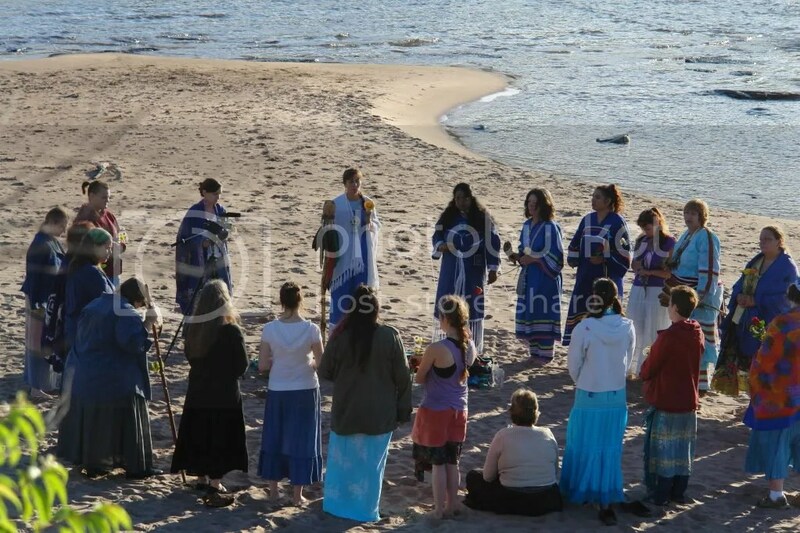 The ceremony was hosted by the Stand for the Land and Oshkinawe-Ogichidaag Akiing (New Warriors for the Earth or NWE) which is a new Native/non-Native environmental organization grounded in Anishinaabe traditions with a mission to educate and empower our communities to take action on mining and other social-ecological issues facing our communities. 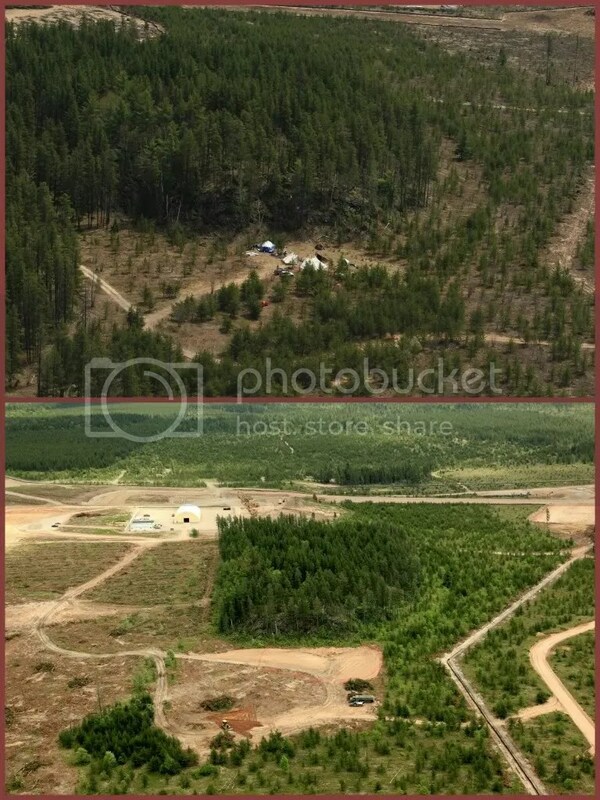 The top photo is front view of Sacred Eagle Rock in May 2010 before the mine-ordered police raid with the encampment tents, lots of trees and other green plants. 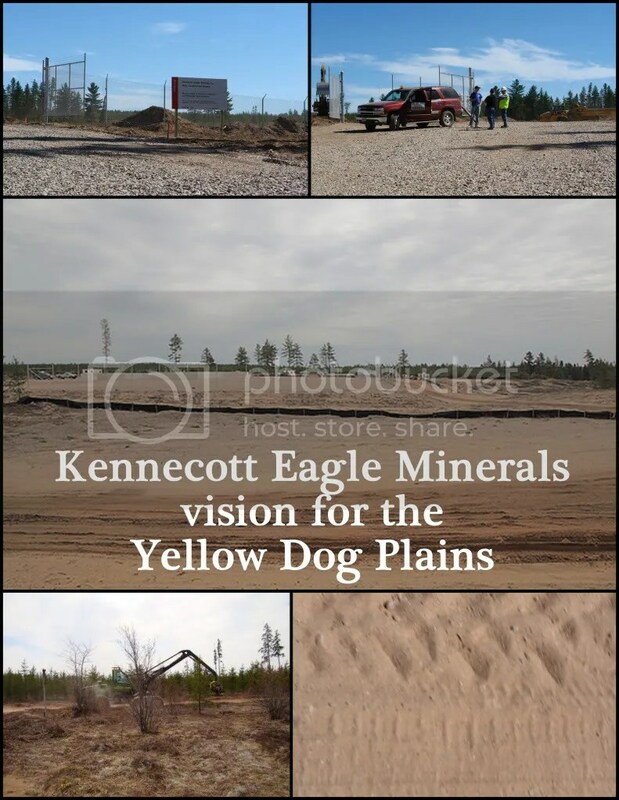 The bottom photos shows Eagle Rock side view with most of the trees and wildlife around the rock destroyed by Kennecott bulldozers. Kennecott Eagle Minerals desecrated sacred Eagle Rock and the Yellow Dog Plains in the summer of 2010 so they could make billions by removing nickel and copper from Mother Earth, in a process that leaves a sulfuric acid byproduct. Kennecott, and its parent company Rio Tinto, is one of the world’s biggest polluters. This is from Jessica Koski of KBIC, who attends Yale University and has been a longtime warrior in the fight to protect sacred Eagle Rock and the Yellow Dog Plains. 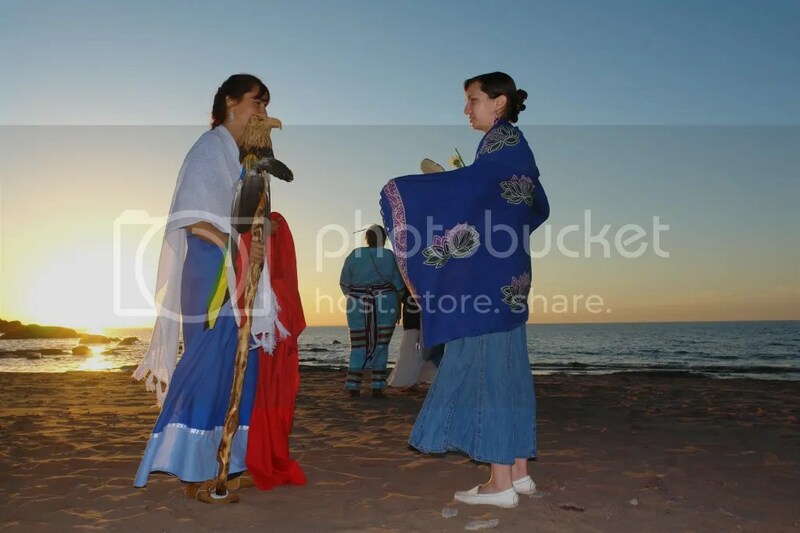 On Saturday, June 19, 2010 in two northern Michigan cities – Marquette and at the KBIC Powwow Grounds in Baraga. 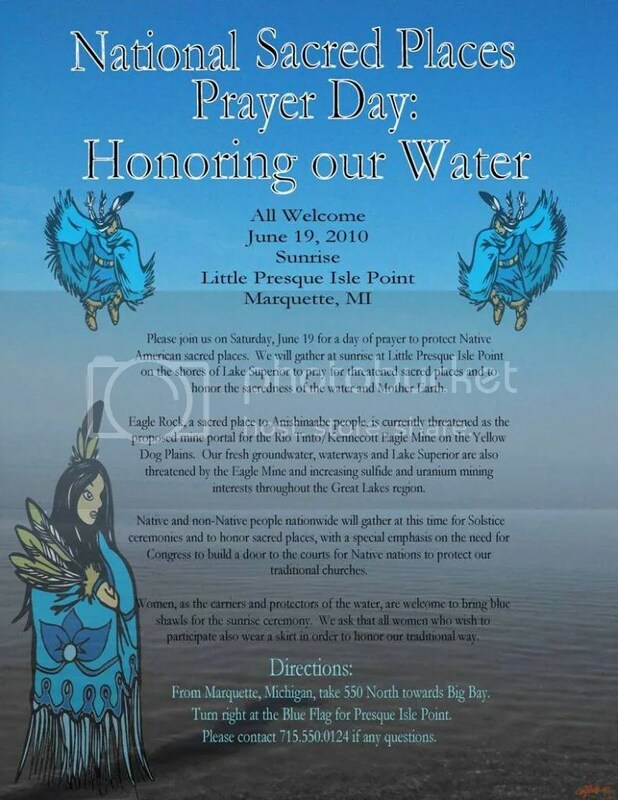 Please join us on Saturday, June 19, 2010 in Michigan’s Upper Peninsula for a day of prayer to protect Native American sacred places. 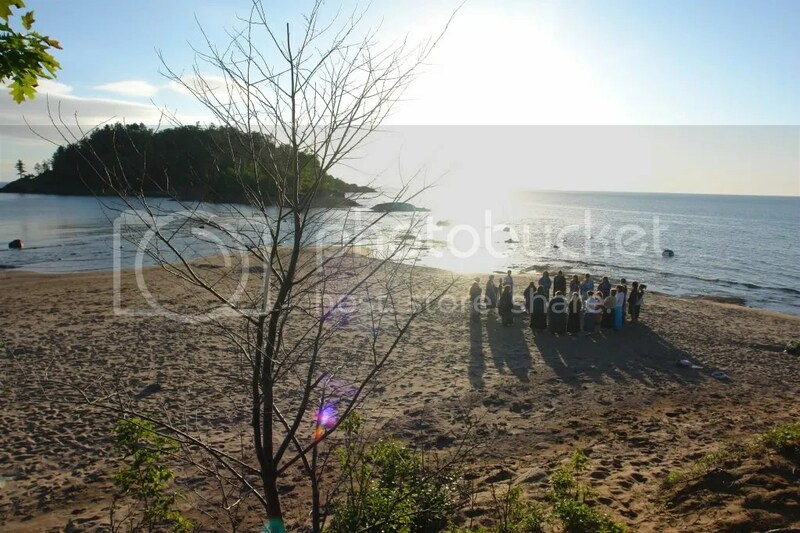 We will gather at sunrise at Little Presque Isle Point on the shores of Lake Superior to pray for threatened sacred places and to honor the sacredness of the water and Mother Earth. 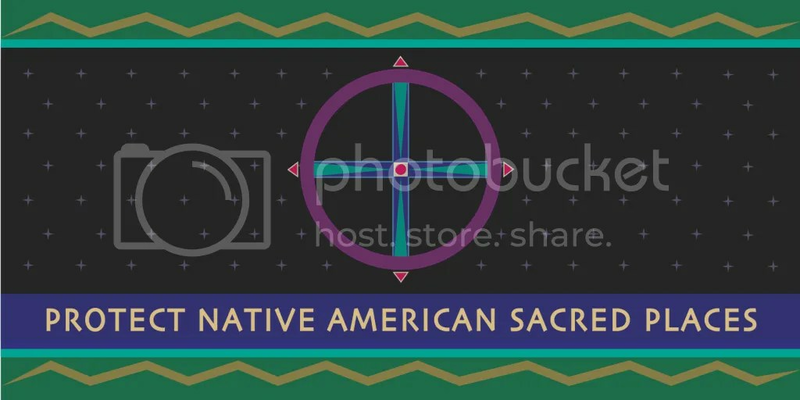 Native and non-Native people nationwide will gather at this time for Solstice ceremonies and to honor sacred places, with a special emphasis on the need for Congress to build a door to the courts for Native nations to protect our traditional churches. We ask that all women who wish to participate wear a skirt in order to honor our traditional way. 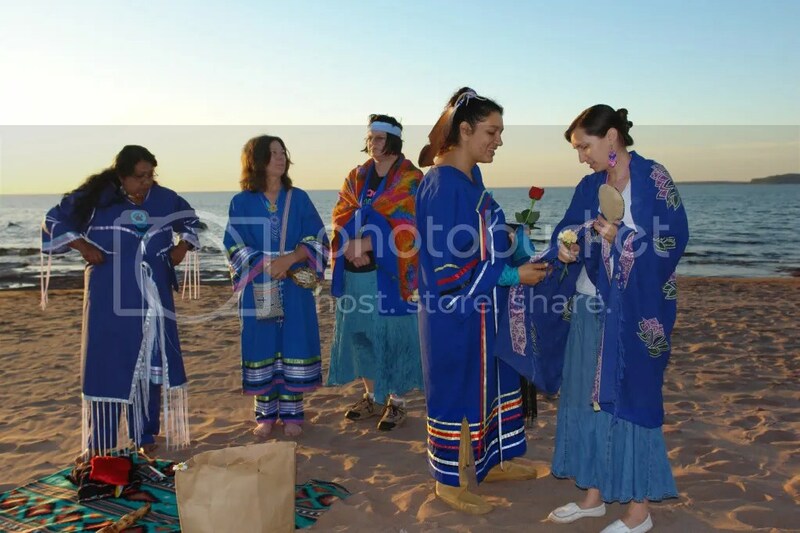 Women are also welcome to bring blue prayer ties and blue shawls for the water. 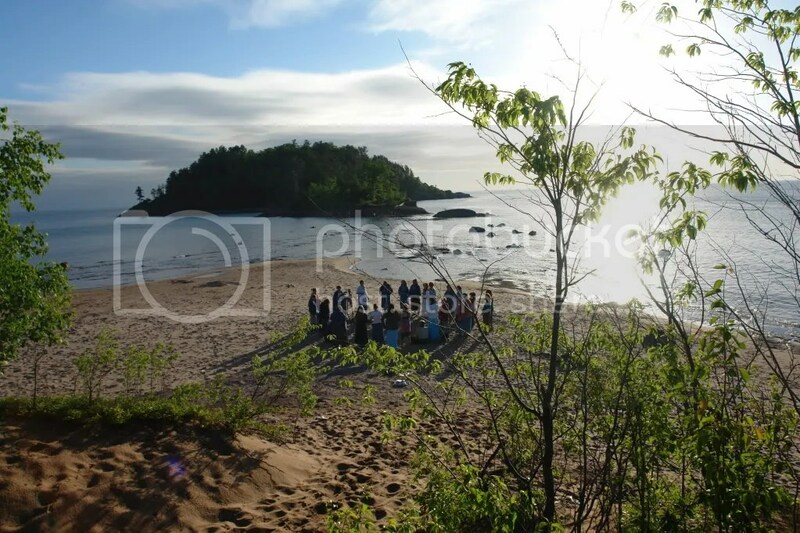 A community potluck picnic and gathering in honor of National Sacred Places Prayer Day will follow at the Powwow Grounds Pavilion in Baraga, MI at 12 noon. Please join to show your support, ask questions and learn how you can help be a part of the movement to protect our sacred places, water and way of life for future generations. From Marquette, Michigan, take 550 North towards Big Bay. Turn right at the Blue Flag for Little Presque Isle Point. From L’Anse, Michigan take US 41 North towards Houghton. Turn right at the Powwow Grounds sign. Turn left at the red building and follow the road to the first pavilion. Please contact jlkoski@gmail.com or 715-550-0124 if any questions. Hosted by the Stand for the Land and Oshki Ogitchidaawin Aki (New Warriors for the Earth or NWE) which is a new Native/non-Native environmental organization grounded in Anishinaabe traditions with a mission to educate and empower our communities to take action on mining and other social-ecological issues facing our communities. 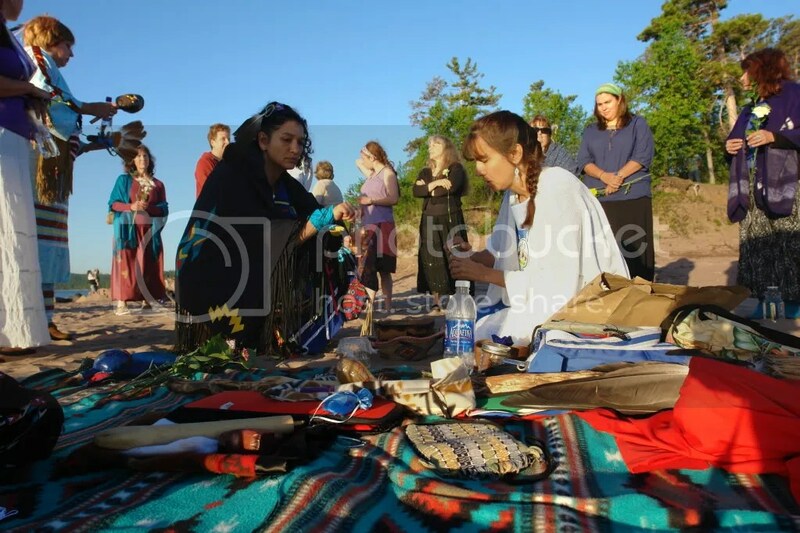 Washington, DC — Observances and ceremonies will be held across the country from June 18 through June 23 to mark the 2010 National Days of Prayer to Protect Native American Sacred Places. The observance in Washington, D.C. will be held on Monday, June 21 at 9:00 a.m. on the United States Capitol Grounds, West Front Grassy Area (see details under the Washington, D.C. listing in the alphabetical list on the following pages). Descriptions of certain sacred places and threats they face, as well as times and places for public commemorations are listed below. Some of the gatherings highlighted in this release are educational forums, not religious ceremonies, and are open to the general public. Others are ceremonial and may be conducted in private. In addition to those listed below, there will be observances and prayers offered at other sacred places that are under threat and at those not endangered at this time. 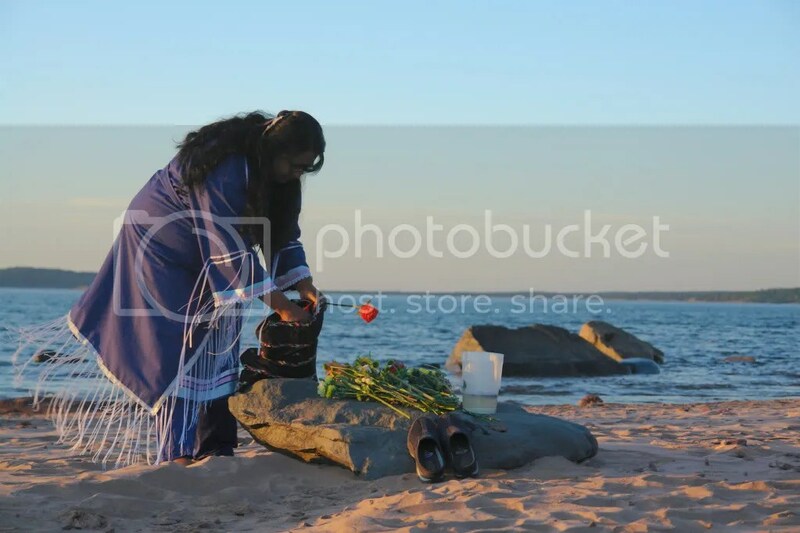 “Native and non-Native people nationwide gather at this time for Solstice ceremonies and to honor sacred places, with a special emphasis this year on sacred waters and those beings that depend on them,” said Suzan Shown Harjo (Cheyenne & Hodulgee Muscogee). She is President of The Morning Star Institute, which organizes the National Sacred Places Prayer Days. “Ceremonies are being conducted as Native American peoples engage in legal struggles with federal agencies that side with developers that endanger Native sacred places,” said Ms. Harjo. All other peoples in the United States can use the First Amendment to protect their churches, but the Supreme Court closed that door to Native Americans in 1988. The Court, from 1988 to 2009, has declined to allow federal religious freedom statutes to be used to protect Native American sacred places or the exercise of Native American religious freedom at sacred places. “Today, Native Americans are the only peoples in the United States who do not have a constitutional or statutory right of action to protect sacred places or our exercise of religious freedom there,” said Ms. Harjo. “Native American sacred places and site-specific ceremonies are under threat from development, pollution, and vandalism. 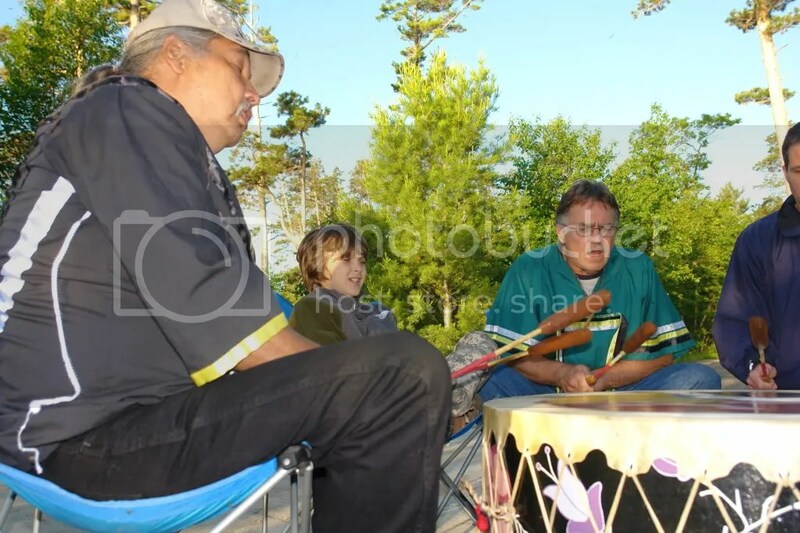 The 2010 observances will be the eighth of the National Prayer Days to Protect Native American Sacred Places. The first National Prayer Day was conducted on June 20, 2003, on the U.S. Capitol Grounds and nationwide to emphasize the need for Congress to enact a cause of action to protect Native sacred places. Native peoples also are encouraged that the U.S. is reviewing the United Nations’ Declaration on the Rights of Indigenous Peoples, and consulting with tribal leaders about whether or not to adopt it. “Article 11, 1: Indigenous peoples have the right to practise and revitalize their cultural traditions and customs. This includes the right to maintain, protect and develop the past, present and future manifestations of their cultures, such as archaeological and historical sites, artifacts, designs, ceremonies, technologies and visual and performing arts and literature. Mount Graham is sacred to the Western Apache people and is known to the San Carlos Apache as Dzil Nchaa Si An. It is a holy landscape where Gaahn or Mountain Spirits reside and ancestral Apache rest. It is a place of ceremonies and medicine plants, and home to the endangered red squirrel. The Pinaleño Mountains or Mount Graham is a unique ecological treasure. It is the tallest mountain in southern Arizona and encompasses six different life zones from the valley floor to its peak at 10,720 ft.
Called a “Sky Island” ecosystem, the old growth forests on Mount Graham’s summit are the Arizona equivalent of rainforests. The abundant springs and high altitude meadows have offered sustenance and a source of healing to Apache people who live in the desert. The cool moist characteristics of the Mountain have nurtured 18 different plants and animals found nowhere else in the world. In the 1980s, the University of Arizona and their partners at the time, including the Vatican and the Smithsonian Institution, chose Mount Graham as the site to construct an observatory with seven large telescopes known as the Columbus Project. Beginning in 1988, the Arizona congressional delegation succeeded in gaining exemptions for the project from the endangered species, environmental, historical preservation and other laws. In 1989, the University of Arizona was granted a 20-year special use permit by the Coronado National Forest and the U.S. Forest Service, and appropriation riders kept the project flush with public benefits without having to abide by federal laws or regulations, including federal Indian laws intended to protect religious freedom, burial grounds and cultural properties. Vatican spokesmen stated that Mount Graham was not a religious or sacred place. University employees and lobbyists attempted to undermine the reputations of Apache religious leaders and practitioners, and retained at least one San Carlos tribal official to testify that the Mountain was not sacred or significant to the Apache peoples. For decades, Apache peoples, scientists, conservationists and university students have resisted the University of Arizona’s decision to build the telescopes on the Mountain’s summit. Even though frequent cloud cover makes telescope viewing marginal and Mount Graham was ranked 38th in a study of astronomical sites in the U.S., the Arizona congressional delegation and the University have persisted with the project. Today, the construction of telescopes and resulting federal closure of the Mountain’s top are desecrating the Mountain and its irreplaceable relationship with Apache peoples. The struggle continues to protect the natural and cultural heritage of Mount Graham from the precedent-setting destruction still being caused by the University in building their observatory on Mount Graham. The efforts of cultural protection and environmental organizations and affected Tribes to protect the sacredness of Mount Graham continue unabated. The University of Arizona is now operating its observatory without a valid special use permit. 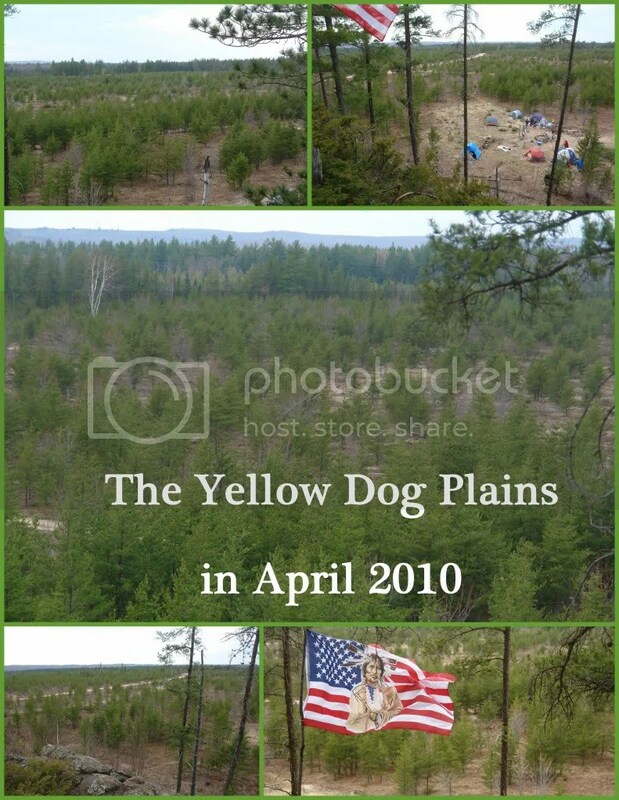 Its 20-year federal permit expired on April 19, 2009. The University has asked the Coronado National Forest for a new permit, but, as of June of 2010, a decision on whether to grant the permit has not yet been made. The Forest Service has determined that it needs to prepare an Environmental Impact Statement (EIS) to gather information as to the pros and cons of granting a new permit. The University has objected strenuously to a new EIS. From what little information the Mount Graham Coalition and the San Carlos Apache Tribe have learned, the Forest Service’s and the University’s lawyers are “in discussions” to determine the final form of the permit renewal process. There are a number of reasons for the Forest Service to deny a new permit. The lapsed permit had a number of terms and conditions that were violated by the University. Many of these conditions should have led to the revocation of the permit but did not. All of these violations need to be studied to determine whether the University can follow the rules of a new permit. The conditions of Mount Graham have changed substantially since the permit was granted and the observatory is even less compatible with the religious and ecological importance of Mount Graham. Since the permit was granted, the “shape” of Mount Graham has been deemed eligible for placement on the national list of historic places. In addition, the Forest Service now acknowledges that Mount Graham is a Traditional Cultural Property to Western Apache people and has taken steps to consult (although it has a long way to go) with traditional Apache about the sacred nature of the Mountain and how to protect it. The University may go to Congress for yet another exemption to religious freedom and environmental laws and to force the Forest Service to issue a new permit. Supporters of Mount Graham would be the last to hear of any lobbying along these lines and must be ever vigilant to stop this from happening. For these and many other reasons, it is important for supporters of Apache peoples and Mount Graham to urge the Forest Service to deny the University a new permit and require that the existing telescopes on Mount Graham be removed. After 20 years of construction, the large telescope project is still not complete and is useless as a scientific instrument. Although the primary mirrors are in place on the telescope, the two secondary mirrors, which are indispensable for the telescope, were broken by the University of Arizona. One was broken while being installed in the telescope and the other was broken at the University’s mirror lab. It will be at least several years before replacement mirrors are cast and ready for the telescope. Since the telescope was originally designed, the University realized what studies had shown all along: Mount Graham is not suitable for a large telescope because of weather and other factors. However, this equipment is a long way from being perfected. Several fires devastated the top of Mount Graham in past years. They were fought to protect the telescopes more than the ecosystem and, as a result, much damage was done to the Mountain that could have been avoided. The Forest Service has decided to thin the forest and otherwise manipulate the ecosystem to try to protect what remains and to restore what has been damaged. The final decision on what “treatments” will be carried out will be released soon. However, there may still be time to weigh in with the Forest Service to make sure that any plan helps and not hurts the Mountain. It also appears that, while the University is unwilling to voluntarily withdraw from Mount Graham, it does admit that serious mistakes were made that it does not to want to make again. Now is the time to gently work with the University to urge it to correct past mistakes. Prayers and diligence are needed now more than ever for Mount Graham. The ecosystem is under serious threat from climate change and other patterns of destruction; there is an opportunity for the Forest Service to deny a new permit for the telescopes and require they be removed; and there is a chance to protect the existing ecosystem and restore some of what has been lost. And, the sacredness of Mount Graham continues to be challenged and, while the Mountain is able to protect itself, supporters can help to protect it. The San Francisco Peaks are on federal land that is sacred to Apache, Hopi, Hualapai, Navajo, Yavapai and other Native nations. The San Francisco Peaks are home to many sacred beings, medicine places and origin sites. Myriad ceremonies are conducted there for healing, well-being, balance, commemoration, passages and the world’s water and life cycles. Indeed, the U.S. Forest Service has indicated that the San Francisco Peaks are sacred and holy to over thirteen Tribes in the southwestern United States. Notwithstanding the foregoing, the Forest Service and the privately owned Snowbowl ski resort, which is located on the San Francisco Peaks, plan to expand the ski area and to use recycled sewage to make artificial snow. The expansion and sewage-to-snow plans could have a disastrous impact on the Native religions and people and on the water and health of the entire region. The creeping recreational development has concerned Native spiritual leaders and tribal officials for decades, but current plans far exceed the past activity at the resort. The area is within the Coconino National Forest. Native nations attempted to protect the San Francisco Peaks in court. The District Court ruled for the development in January 2006. In March 2007, the Ninth Circuit Court of Appeals overturned the lower court’s decision and ruled for the Hopi Tribe, Navajo Nation and others. A three-judge panel of the Ninth Circuit ruled that the Forest Service violated the Religious Freedom Restoration Act and the National Environmental Policy Act in allowing the Snowbowl Resort to expand over 100 acres of rare alpine ecosystem, part of the area that is sacred to Native Peoples. The federal government challenged that decision and petitioned the Ninth Circuit for rehearing en banc. Such petitions are rarely granted, but the Court granted this one. The case was argued in front of the 11-judge en banc panel of the Ninth Circuit in Pasadena in December 2007. The Ninth Circuit issued the decision of the en banc panel on August 8, 2008, ruling in favor of development. The Native nations submitted a writ of certiorari for the U.S. Supreme Court. On June 8, 2009, the Supreme Court declined to review the decision. The Tribes attempted to reach some sort of administrative accommodation with the new Administration, but such efforts have not borne fruit. The Save the Peaks Coalition subsequently filed suit against the federal government on a NEPA issue. Oral arguments on the case were scheduled for June 14, 2010. The Court unilaterally issued a new order in May, requiring briefing on the issue of res judicata and rescheduling the oral argument to July 16, 2010, at the U.S. Federal Courthouse in Phoenix, Arizona. Gatherings and prayer vigils are being held at the Courthouse. Medicine Lake Highlands is a critically important tribal region located northeast of Mount Shasta in the mountains of northern California. The Pit River, Modoc, Shasta, Karuk, Wintu and other Tribes revere the area for its natural healing powers and for its connections to their Tribes’ longstanding histories. For example, the Pit River Tribe believes that the Creator and his son bathed in Medicine Lake after they created the earth, and the Creator imparted his spirit to the waters. Because of the Lake’s sacredness, Tribes from the coast of California to the Rocky Mountains use the surrounding area as a training ground for medicine people. The Highlands is also sought after by geothermal energy companies that have applied for development permits from the Bureau of Land Management (BLM) and the U.S. Forest Service (USFS), which manage the area. Since the 1990s, the Pit River Tribe, Stanford Environmental Law Clinic and other supporters of the protection of the sacred Medicine Lake Highlands in northeastern California have been challenging the BLM and USFS failure to undertake adequate environmental review and tribal consultation for industrial-scale energy development in the Highlands. On November 6, 2006, the Ninth Circuit Court of Appeals ruled that the BLM and USFS original extension of Calpine Corporation’s geothermal leases in the Highlands violated both the National Environmental Policy Act (NEPA) and the National Historic Preservation Act (NHPA). The agencies should have prepared an Environmental Impact Statement (EIS) before renewing the leases and should have included a “no action” alternative. Because the agencies violated NEPA and NHPA, both the five-year lease extensions and the subsequent 40-year extensions were undone. The Court also said that BLM and USFS violated their fiduciary duty to the Pit River Tribe by failing to complete an EIS before extending the Calpine leases. When the case was sent back to the trial court to implement the Ninth Circuit’s decision, the trial judge ruled that, notwithstanding the invalidation of the lease extensions, the 1988 leases were still intact. In response, Stanford Environmental Law Clinic (SELC) filed an appeal challenging the lower court’s interpretation, which went directly against the original Ninth Circuit ruling. At the new hearing on March 10, 2010, the SELC attorneys maintained that the leases, originally issued in 1988 for a duration of five years, and renewed once, expired by their own terms when the 1998 renewals for 40 years were declared null and void by the Ninth Circuit judges. The outcome of the latest hearing is expected soon, so prayers are requested that the Court will fully support the protection of the sacred Medicine Lake Highlands. The culturally-important Hatchet and Bunchgrass Mountains and the surrounding lands in Traditional Pit River Indian Territory are in jeopardy of being destroyed, due to a plan to build 49 monolithic windmill energy turbines and related roads and ancillary, interconnections, operations and maintenance facilities in the heart of this region. Hatchet Ridge Wind Company, an affiliate of RES America Developments and Renewable Resources, is initiating its windmill construction project. The project would significantly and negatively alter over 100 acres of this natural region and include up to 49 turbines on steel towers with a height of up to 503 feet. Ancillary facilities would include a substation, an overhead transmission circuit, a switching/interconnection facility and a control room/operations and maintenance building. Access roads would be built, including 6.5 miles of 20-foot-wide permanent roads, and one mile of additional roads. The project would have severe negative impact on sacred and cultural places, as well as on the winged and four-legged beings. Native people could no longer access particular ceremonial plants on Hatchet Mountain as part of their cultural practices and they do not support the project. The visual impact of the towers on the ridge destroys the integrity of the setting of this sacred area. Birds traditionally important to the local tribal culture, such as eagles, ospreys, ducks and geese, cross the ridge and would be shredded by the blades. Migration routes of deer across the ridge could be disrupted. Sound quality issues would also affect the serenity and isolation of the ridge, disrupting human experiences in the area. Bunchgrass Mountain is just north of the area impacted by the project. An ancient trail runs along the top of the ridge top, connecting the Pit River to Goose Valley and sites downriver; in addition to regular travel, this trail is used to reach remote areas during vision quests and such quests continue among some young men. Clearly, the proposed windmill project will have severe negative impacts on the natural world, as well as the well-being and cultural rights of Native peoples. Advocates for the Protection of Sacred Sites and their allies have protested against the project, will continue to do so and will not sit idly by and allow the destruction of important sacred and cultural regions to take place. California: Needles – Ft. Mojave Indian Tribe, Saturday, June 19, 6:00 a.m. The Ft. Mojave Indian Tribe remains in urgent need of prayer to protect the Maze and surrounding sacred areas along the Lower Colorado River. The Maze is both a physical manifestation and a spiritual pathway for the afterlife. It has always been, and will always be, an integral and significant part of the Mojave way of life, beliefs, traditions, culture and religion. The Mojave will observe the Prayer Day at a geoglyph feature northwest of the Maze property. This geoglyph is connected to the Maze and tells the story of the whole area. The geoglyph has been impacted by off highway vehicle and recreational use. Pacific Gas & Electric, by its ownership and operation of the Topock Natural Gas Compressor Station near Needles, California over the last 50 years, has polluted the groundwater under and around the Maze with hexavalent chromium, a toxic chemical that can cause numerous human and ecological health problems. PG&E, BLM and California Department of Toxic Substances Control proceeded with Interim Measures to contain and investigate the contamination, which included the construction of a new Treatment Plant within the Maze area and the drilling of about 150 wells in California and Arizona, on either side of the Colorado River. These, taken together, create continuing cumulative adverse impacts to the sacred landscape and tribal beliefs. In 2005, Ft. Mojave filed a lawsuit seeking the removal of the plant, total restoration of the sacred area, an environmental baseline of prior to the plant’s construction and any other actions that could serve to remedy the desecration. Settlement negotiations concluded in November 2006 aimed to achieve each of these goals and secure other remedies including repatriation of the sacred area to tribal ownership, sensitivity training for PG&E employees and contractors, a written public apology and reimbursement of past and future tribal costs. The 125-acre parcel, containing portions of the Maze, came back into tribal ownership this year amid a celebration at the property. Even though settlement was achieved, deep prayer is still needed to ask for a deeper understanding by PG&E and the agencies, particularly the BLM and USDOI, as to the nature of this traditional cultural landscape and that they should not be afraid to acknowledge it as “Sacred in its Entirety” during selection of the Final Remedy which is expected to occur in late Fall 2010.
b) Measures to strengthen traditional Mojave spiritual, cultural and funerary traditions; and c) Measures to continue to allow the Tribe to participate in the remediation project. Prayer is also needed to ask for forgiveness for any continuing desecration that may occur until the offending facilities, including the interim measure treatment plant, are actually removed and that the Final Remedy will respect the sacred nature of this area. This issue is national in scope: the Maze has been officially listed on the National Register of Historic Places since 1978 and is formally recognized as nationally significant. Moreover, the failure of state and federal agencies to consider direct and indirect impacts to Native sacred places during pollution remediation activities remains a national problem requiring congressional oversight. California: Redlands – California-Pacific Annual Conference of The United Methodist Church at the University of Redlands, Friday, June 18, at 7:00 a.m.
A Prayer Observance for Sacred Places will be conducted on Friday, June 18, at 7:00 a.m., on the Quad at the University of Redlands in Redlands, California. The Prayer Observance will take place during the California-Pacific Annual Conference of The United Methodist Church. It will be led by Rev. Cynthia Abrams (Seneca) and Suanne Ware-Diaz (Kiowa), who welcome and encourage the public to join them, along with the delegates and guests attending the Conference. Contact: Suanne Ware-Diaz at soozware@yahoo.com or (571) 236-7274. The Viejas Band of Kumeyaay Indians respectfully requests prayer for the preservation of a Kumeyaay tribal burial ground and ceremonial place that is under the threat of imminent destruction from a local water district reservoir and pump station project near San Diego, California. Viejas prays for an end to the severe and irreparable harm done to burials and ceremonial places within our ancestral territory over the last 100 plus years. A hearing is scheduled June 17, 2010, before the state Native American Heritage Commission to determine whether the site should be declared a sanctified tribal cemetery and ceremonial site. If the Commission makes those findings, the state attorney general could sue the water district if it continues building there. Viejas also requests urgent prayer for a successful outcome to the lawsuit filed by it June 1, 2010, to enjoin construction there and stop the harms committed by the water district against our ancestors at this property. The Tribe’s Superior Court hearing for a preliminary injunction is scheduled for June 25, 2010. Colorado: Boulder – Native American Rights Fund, Monday, June 21, at 6:00 a.m. 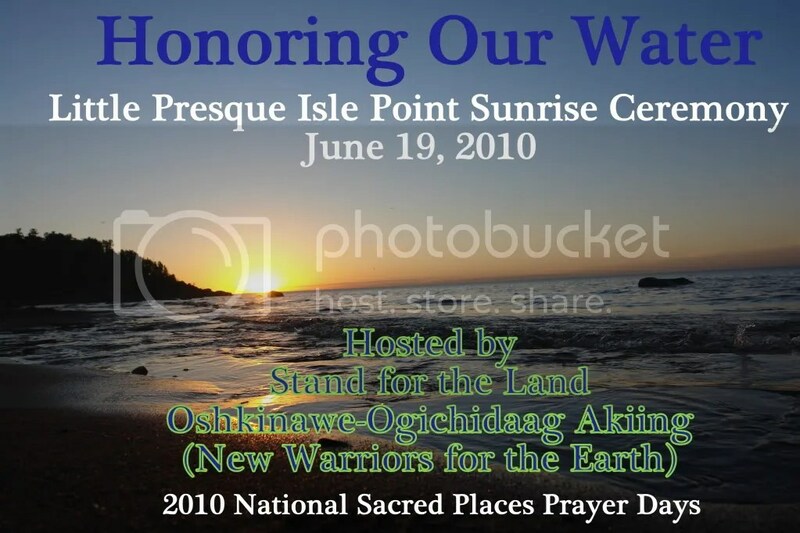 The National Day of Prayer to Protect Native American Sacred Places is being observed at the Native American Rights Fund on Monday, June 21, 2010, at 6:00 a.m. The public is welcome to a Sunrise Ceremony that will be held on NARF’s front lawn beginning at 6:00 a.m. The program is expected to last for one hour with a prayer ceremony. Andy Cozad from the Native American Church and John Echohawk, NARF Executive Director, will be speaking, as well as other NARF staff. Speakers will be followed by a moment of silence to show concern for the sacred places that are being damaged and destroyed today. The Native American Rights Fund is headquartered at 1506 Broadway in Boulder, Colorado. NARF extends an open invitation to its program and requests that participants bring a chair or a blanket to the front lawn and to bring food and/or beverages to share at the completion of the program. As part of its mission, the Native American Rights Fund advocates for sacred site protection, religious freedom efforts and cultural rights. NARF attorneys and staff participate in local and national gatherings and discussions about how to protect lands that are sacred and precious to Native Americans. The NARF utilizes its resources to protect First Amendment rights of Native American religious leaders, prisoners and members of the Native American Church, and to assert tribal rights to cultural property and human remains, in compliance with the Native American Graves Protection and Repatriation Act. Contact: Native American Rights Fund at (303) 447-8760. Haskell Wetland Preservation Organization (WPO) and Save the Wakarusa Wetlands will observe National Prayer Day at Sunrise (about 5:45 a.m.) on Sunday, June 20, beside the Wakarusa Wetlands at the Haskell Medicine Wheel south of Lawrence, Kansas. Haskell WPO is a Native student organization, and Save the Wakarusa Wetlands, Inc., is an association of Lawrence-based supporters among from Haskell Indian Nations University, University of Kansas, Washburn University, and Baker University alumni, students and community supporters. In case of lightning strikes, funnel clouds or other severe weather, the observation will take place on Monday, June 21, at Sunrise. The ceremony will be led by Millie Pepion, President of WPO, and is open to all who wish to add their prayers to save this sacred place from the highway builders. Participants will ask for the protection of the Wakarusa Wetlands (aka, Haskell-Baker Wetlands), threatened by an eight-to-ten lane highway project approved by the Army Corps of Engineers, but delayed by state budget constraints and a federal law suit filed by WPO and a consortium of supporter groups, including Jayhawk Audubon, Kansas University Environs, Save the Wakarusa Wetlands, Kansas Sierra Club and KU EcoJustice. Recently, Douglas County drained the entire wetlands remaining on the Haskell campus. Local officials claim this was necessary to protect a road segment they intend to remove soon if the South Lawrence Trafficway is built through the wetlands just to the south of the campus. This obscene act eliminated the last small portion of the Wakarusa Wetlands remaining within the current boundaries of Haskell Indian Nations University. This sacred place is the last significant trace of the original Wakarusa Bottoms, an 18,000-acre prairie wetland environment that existed for thousands of years before whites drained and dammed the wetlands, which supplied Native peoples of the region with valuable medicines and important ceremonial items. Elders have said the Creator caused the course of the Wakarusa River to go directly east toward the rising sun, in sharp contrast to the other rivers in the region, as a sign of sacred healing plants and herbs found in abundance there. About 600 acres of the Wakarusa Wetlands was located directly south of the dorms at Haskell Institute, long the nation’s largest and most tribally diverse federal boarding school. This last major remnant of the wetlands was a crucial refuge where Native students from all across the country survived government efforts to exterminate their cultures. There, in the Wakarusa Wetlands refuge, young Indians from Maine to California sang forbidden songs, performed dances that were federally punishable with jail time and refused to let authorities “kill the Indian” in them. Parents and other tribal leaders camped, sometimes for weeks or months, beside these wetlands on the north bank of the Wakarusa. They were awaiting permission from school officials to retrieve or at least visit their children. These elders used the Wakarusa Wetlands as an outdoor classroom to pass on final lessons about healing and other traditional knowledge. The wetlands quickly became the most essential place where Haskell students could get news about family and fellow tribesmen. The wetlands was where they heard about what was happening back home in the crucial era of enrollment, allotments and the selling off of their homelands. The wetlands also provided the least censored way to send messages home whenever someone speaking a related language arrived in camp, as against learning enough English to send a letter that had to pass censorship by both school authorities and the federal agents interpreting the contents to one’s parents. Despite massive efforts to drain the wetlands in the early twentieth century, and Haskell’s loss of all but a few acres of this property during the Eisenhower termination era, the Wakarusa Wetlands, like Haskell Indian Nations University itself, has survived and flourished. The entire historic Haskell campus, including the Wetlands, is being considered for designation as a National Historic Heritage area. Massachusetts: Palmer – World Peace and Prayer Day, Monday, June 21, Ceremony at 7:00 p.m.
Arvol Looking Horse, 19th Generation Keeper of the Sacred White Buffalo Calf Pipe and organizer of the World Peace and Prayer Day, will conduct a public ceremony on Sunday, June 21, at 7:00 p.m., Blue Star Equiculture at Burgundy Brook Farm in Palmer, Massachusetts. “The dangers we are faced with at this time are not of spirit. The catastrophe that has happened with the oil spill which looks like the bleeding of Grandmother Earth, is made by human mistakes, mistakes that we cannot afford to continue to make….We ask for prayers that the oil spill, this bleeding, will stop. That the winds stay calm to assist in the work. Pray for the people to be guided in repairing this mistake, and that we may also seek to live in harmony, as we make the choice to change the destructive path we are on. “So let us unite spiritually, All Nations, All Faiths, One Prayer. Along with this immediate effort, I also ask to please remember June 21st, World Peace and Prayer Day/Honoring Sacred Sites day. All are welcome to join us on Saturday, June 19, 2010, for Sacred Places Prayer Day: Honoring Our Water. 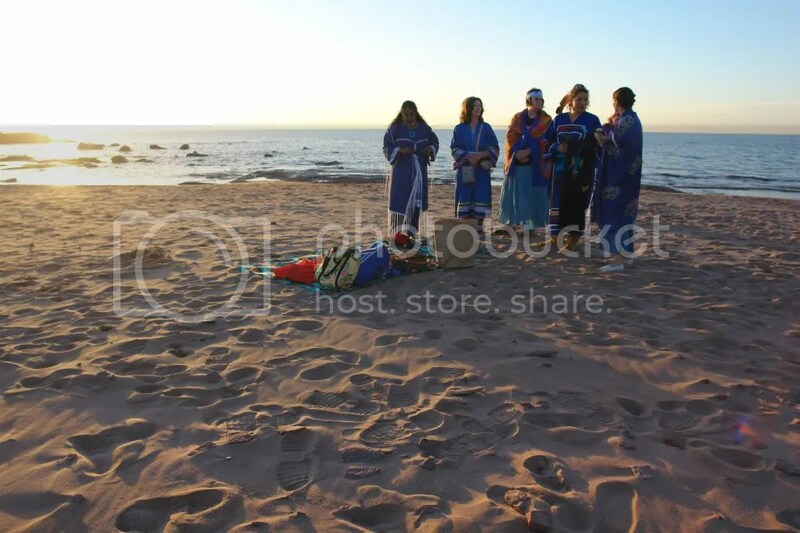 We will gather for a Water Ceremony at Sunrise at Little Presque Isle Point on the shores of Lake Superior to pray for threatened sacred places and to honor the sacredness of the water and Mother Earth. 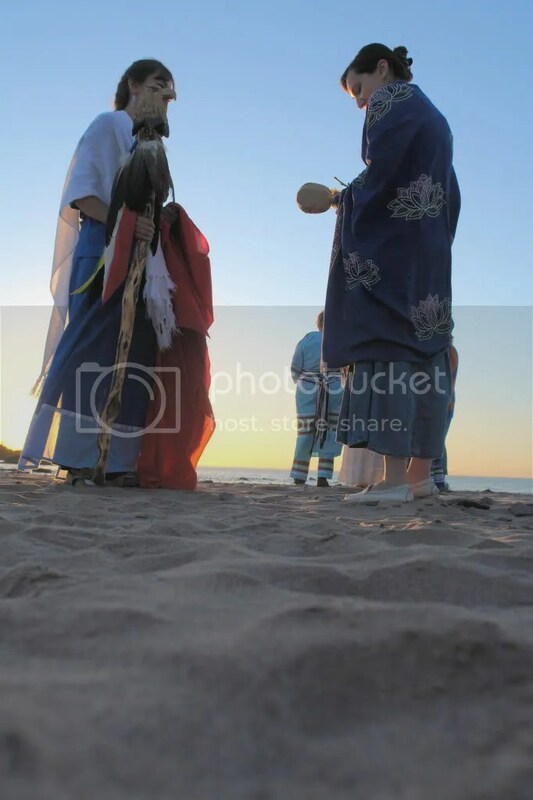 Women are encouraged to bring blue prayer ties and blue shawls for the water. We also ask that all women who wish to participate wear a skirt in order to honor our traditional way. 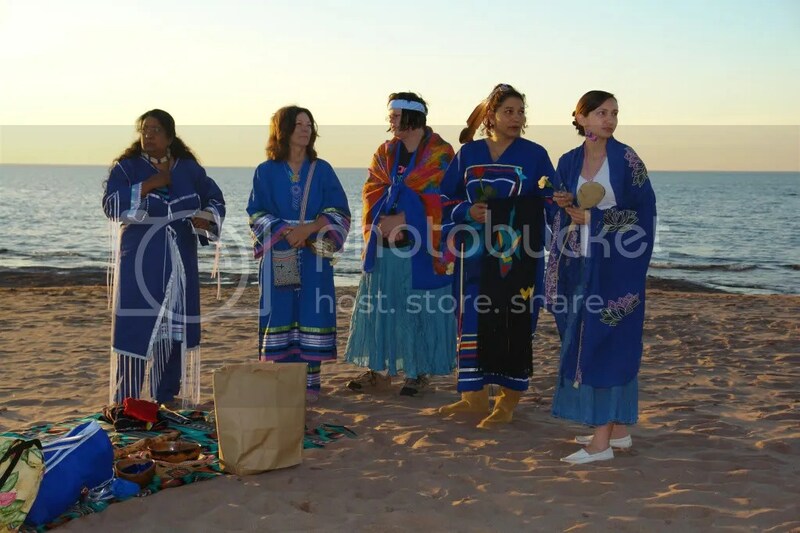 A Community Potluck Picnic and Gathering in honor of National Sacred Places Prayer Day will follow at the Powwow Grounds Pavilion in Baraga, Michigan, at 12:00 Noon. Directions to Little Presque Isle Point: From Marquette, Michigan, take 550 North towards Big Bay. Turn right at the Blue Flag for Little Presque Isle Point. Directions to Baraga Powwow Grounds Pavilion: From L’Anse, Michigan, take US 41 North towards Houghton. Turn right at the Powwow Grounds sign. Turn left at the red building and follow the road to the first pavilion. 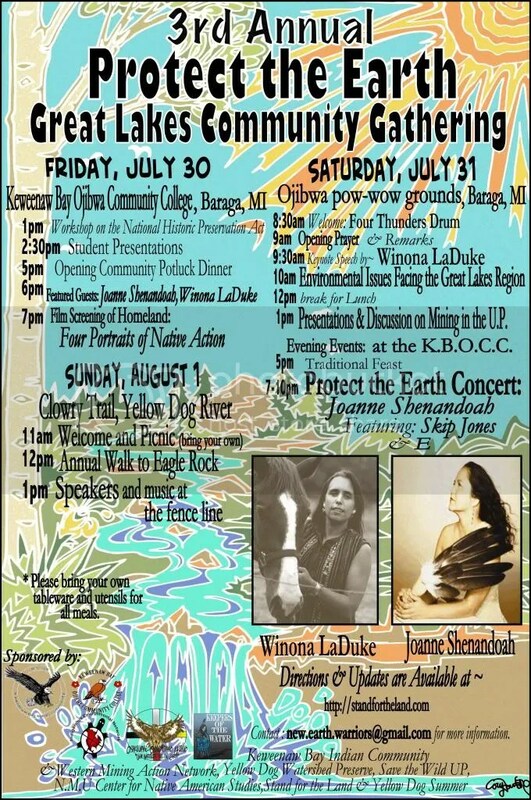 These events are being hosted by the Stand for the Land and Oshki Ogitchidaawin Aki (New Warriors for the Earth or NWE), which is a new Native/non-Native environmental organization grounded in Anishinaabe traditions with a mission to educate and empower our communities to take action on mining and other social-ecological issues facing our communities. Please contact Jessica Koski, at jlkoski@gmail.com or 715-550-0124, if you have any questions. Monday, June 21, 6:00 p.m. Rain Cloud will gather on Monday, June 21, at 6:00 p.m., to offer prayers for sacred places. A Pipe Ceremony will be conducted at the time of the Solstice in the parking lot of the Albuquerque Center for Peace and Justice, at 202 Harvard Drive, Southeast, in Albuquerque. Rain Cloud is a local collaborative, dedicated to increasing and improving behavioral health services and empowering Indian people living in off-reservation Indian communities in New Mexico. It was created as a result of the State of New Mexico’s behavioral health transformation initiative, which began in 2005. Rain Cloud was granted local collaborative status in January 2009. In New York City, the American Indian Community House and the American Indian Law Alliance are sponsoring an observance at Noon on Friday, June 18, for the protection, health and well-being of all sacred places. The program is expected to last for one hour and the public is welcome to attend. The American Indian Community House is located at 11 Broadway, Second Floor. At Ganondagan State Historic Site in New York, there will be a Gahnonyoh (Thanksgiving), starting at 11:30 a.m. and ending at Mid-day, on Monday, June 21, to protect sacred places and to promote world peace. “We invite spiritual leaders and the general public to join us on that day as we offer words of Thanksgiving or Gahnonyoh in Seneca,” says G. Peter Jemison (Seneca), who is the Caretaker of Ganondagan. Ganondagan is the site of the seventeenth century town, once the capitol of the Seneca Nation, which was destroyed by the French in 1687. Today, it is the only historic site in New York dedicated to a Native American theme. Ganondagan is sacred to the Seneca People because nearby are the remains of Jikonhsaseh the Mother of Nations, who was the first person to accept the message of Peace brought by the Peacemaker, who united the Haudenosaunee or Five Nations: Seneca Nation, Cayuga Nation, Onondaga Nation, Oneida Nation and Mohawk Nation. New York: Onondaga Lake Park, Friday, June 19, Sunrise, 6:00 a.m.
Onondaga Nation invites all to Honor the Lake with a peaceful gathering at Onondaga Lake Park, Friday, June 19, at Sunrise, 6:00 a.m. The gathering will occur beside Onondaga Lake near the Salt Museum. All who wish for the full clean up and healing of the Onondaga Lake are invited to attend and to bring friends and family. Please note that Prayers and Meditations for the Lake take place on an ongoing basis. 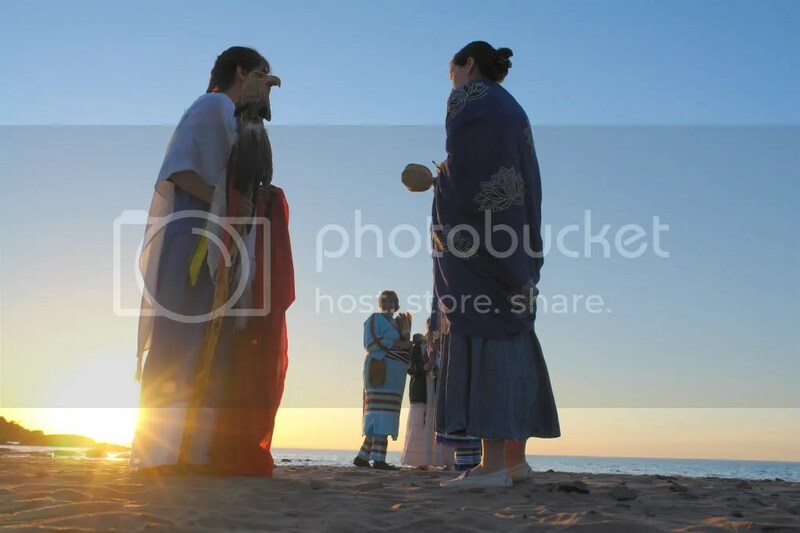 Private prayer ceremonies will be held on the Fort Berthold Reservation for the sacred and cultural places all along the Missouri River and its tributaries, which have been the home of many Native Nations since the beginning of time. Ohio: Newark – Newark Earthworks, Eagle Mound, Great Circle, Sunday, June 20, 7:00 p.m. The Native American Indian Center of Central Ohio (NAICCO) is answering the call of Arvol Looking Horse, the 19th Generation keeper of the Lakota/Dakota/ Nakota Sacred Bundle and The Morning Star Institute for the 2010 National Days of Prayer to Protect Native American Sacred Places. 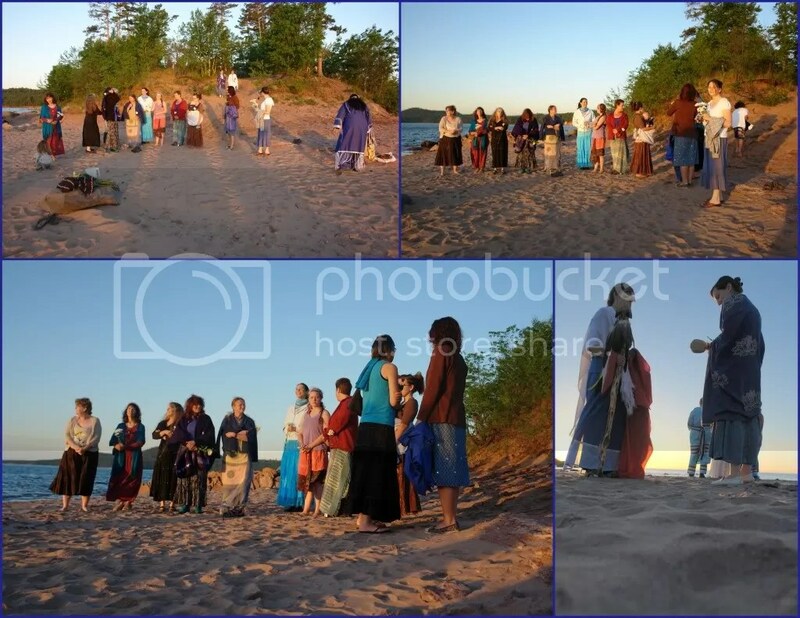 NAICCO is having an Intertribal and Interdenominational Prayer Circle and Talking Circle at the Eagle Mound in the Great Circle in Newark/Heath, Ohio, on Sunday, June 20, at 7:00 p.m. The General Community is invited to join us as we pray for Mother Earth and for all of Creation. The Newark Earthworks are large, deliberately designed areas of earthworks built 2,000 years ago over a 4-square mile area by the Indigenous Peoples of the Hopewell Culture. Before the destruction of most of the Earthworks during the establishment of the city of Newark, Ohio, the Earthworks consisted of a complex and extensive array of circles, a square, an octagon, parallel embankments and circular and elliptical mounds. The remaining sites range in size from 20 to 50 acres, where each earthworks is in a geometric shape with earthen walls that vary from 6 to 30 feel tall and are connected by walled earthen roadways. In addition to the geometric forms, there was the apparent use of a standard unit of measure and other mathematical consistencies in the spacing of the earthworks. The Octagon Earthworks is an astronomical calendar tracking the 18.6-year lunar cycle, marking the lunar standstills in spectacular moonrises. It was built in the shape of a circle and octagon connected by a walled ceremonial road, and covers a total of more than 20 hectares of land. The Great Circle is nearly 1,200 feet in diameter and was possibly used as a ceremonial center and game courts by its builders. The Ellipse was a walled cemetery with many burial mounds and contained an earthen circle open to the east, before its destruction and excavation to clear the land for heavy industry. The Great Circle and the Octagon Earthworks have been acknowledged as sacred places and have become state parks/monuments. However, the Octagon Earthworks are leased to a private country club and open to the public only four days per year. The Ellipse cemetery is owned privately and currently being prepared for sale as an industrial park. Many of the major earthworks in Ohio are now under consideration for designation as World Heritage Sites by the United Nations Educational, Scientific, and Cultural Organization [UNESCO], and a proposal is being prepared. For more information about June 20th event, contact: Mark Welsh at 614-443-6120. Oklahoma: TICAR, Friday-Saturday, June 18-19, The Coyote Creek Center for Environmental Justice in Marlan – Friday, June 18, Supper/Presentations, 6:00 p.m.	Saturday, June 19, Tour, 8:30 a.m. to 10:30 a.m. The Tulsa Indian Coalition Against Racism (TICAR) is honored to co-sponsor with The Coyote Creek Center for Environmental Justice events in honor of the Southwest Organizing Project, the Peoples’ Freedom Caravan and the National Sacred Places Prayer Day. (10 miles north of the Cimarron Turnpike) HWY 412 exit on HWY 177 North and 5 miles east on Acre Road. Signs will be posted on HWY 177 North. The program for Friday, June 18th, begins with Supper at 6:00 p.m., followed by Presentations and statements from TICAR and any other invited groups, a Cultural presentation and Open discussion. The Toxic Tour Caravan will be conducted on Saturday, June 19th, from 8:30 a.m. to 10:30 am. Traveling with the Albuquerque-based Southwest Organizing Project and the Peoples’ Freedom Caravan to the US Social Forum in Detroit are representatives from El Centro de Igualdad y Derechos (immigrant rights group), New Mexico Youth Radio, the Chain Breaker Collective (bicycle collective from Santa Fe) and the Multicultural Alliance for a Safe Environment (MASE, anti-uranium mining group from NW New Mexico). From Southwest Workers Union are: Fuerza Unida, Mexican American Studies Student Organizaiton (MASSO), Youth Leadership Organization (YLO), Mecha, NRP, Progressive Leadership Alliance in Nevada, Pushback Network, Via Campensina from Guatemala. For more information please call: 580-268-3017. The National Congress of American Indians (NCAI) will observe the National Day of Prayer to Protect Native American Sacred Places on Wednesday, June 23, at 7:00 a.m., on the Grounds of the Rapid City Convention Center. The observance will take place on the final day of the annual NCAI Mid-Year Conference in Rapid City, South Dakota. 12:00 Noon, Moccasin Bend Mound. Nashville – 2:30 p.m., Fewkes Mound Site, Primm Park, Brentwood. In Tennessee, there will be gatherings in Chattanooga and Nashville to pay respects to two remaining sacred places and two lost sites. The public is invited to observe the National Day of Prayer to Protect Sacred Places on Sunday, June 20. The first gathering will take place at Sunrise, 6.30 a.m., at Chickamauga Mound, one of two remaining Woodland-period mounds in Chattanooga. Everyone is requested to bring breakfast food to share. The address is 3701 Amnicola Hwy, Chickamauga Creek Riverwalk Park, Chattanooga. A second gathering will take place at 9:00 a.m., at the Davis Town Site at Brainerd Levee, which is a site of Native/Spanish contact in the 16th Century. Human remains and sacred objects taken from this Mound have yet to be reinterred. Public parking is available off Shallowford & N. Moore Road, Chattanooga. The third gathering will take place at 12:00 Noon at Moccasin Bend Mound, which is one of two remaining Woodland-period mounds in Chattanooga. Pine Breeze Building, Chattanooga. In Nashville, the gathering will take place at 2:30 p.m., at the Fewkes Mound Site, at Primm Park, Brentwood. Human remains and sacred objects taken from this Mound have yet to be reinterred. Tom Kunesh at tpkunesh@chattanooga.net or 423-781-0197. For the Nashville gathering, contact: Melba Checote Eads at melbaceads@dtccom.net or 615-210-7276. Washington, DC: U.S. Capitol, West Front Grassy Area – June 21, Monday, at 9:00 a.m. The observance in Washington, DC, will take place at the U.S. Capitol on the West Front Grassy Area on Monday, June 21 at 9:00 a.m. The public is invited to attend this respectful observance to honor sacred places, sacred beings and sacred waters, and all those who care for them and protect them from harm. The observance will take the form of a talking circle. All are welcome to offer good words, songs or a moment of silence for all sacred places, beings and waters, especially for those that are being threatened, desecrated or damaged at this time. This observance is organized by The Morning Star Institute, a national Native rights organization founded in 1984 and dedicated to Native Peoples’ cultural and traditional rights, including religious freedom and sacred places protection. Washington: Snoqualmie Falls, at the Cedar Tree, Monday, June 21, 7:00 a.m.
Snoqualmie Falls is a Sacred Place of Creation for the Snoqualmie and other Tribes of the Puget Sound region. On June 21st, Monday, at 7:00 a.m., there will be a gathering at the base of the Cedar Tree, where Snoqualmie and other tribal people will share heartfelt words and uplift one another. The Snoqualmie Tribe has exhausted its legal remedies in their decades old challenge of the Federal Energy Regulatory Commission’s licensing of the hydroelectric facility at Snoqualmie Falls. In June of 2009, the Bellevue, Washington-based Puget Sound Energy announced that it has a federal license to operate for another 35 years and will spend $250 million to redevelop the hydroelectric project. Puget has been busy in the last year, re-envisioning this Sacred Place from top to bottom, literally. Most recently was the re-opening of the Public Park at the top of the Falls after a closure for extensive landscaping projects. Its press announcement stated that it was now ready for the next generation to enjoy. Puget Sound Energy, which owns the park and powerhouses at Snoqualmie Falls, has just closed the trail and lower falls park for sweeping renovations. The next opportunity to hike to the base of the 268-foot waterfall will be several years from now.